Did you know that buildings contribute two-thirds of the carbon footprint we’re constantly creating? Greening up your existing warehouse—using sustainable practices, products and procedures—can reduce your facility’s carbon footprint, lessen consumption and lower energy costs. Not to mention, good environmental citizenship also creates positive public relations and customer goodwill…and because it’s the right thing to do. 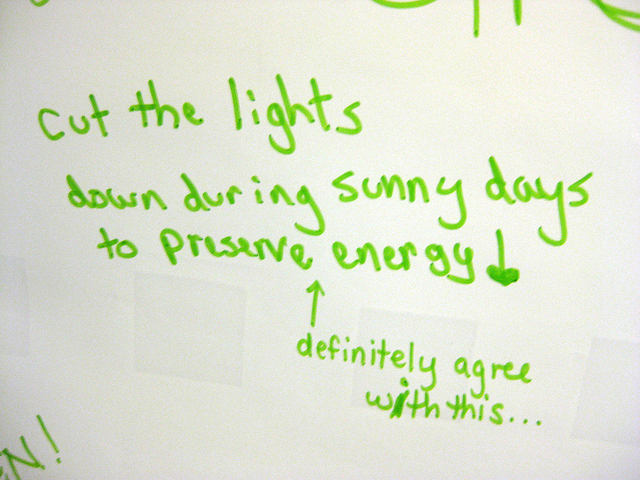 However, going green isn’t just altruistic; it really can make dollars and sense! Many green warehousing and building techniques may be more expensive in terms of initial investment, but they will quickly pay for themselves through energy cost savings. Replace conventional metal halide lamps with HIF (high intensity florescent), LED (light-emitting diode) or induction lighting for substantial energy savings. 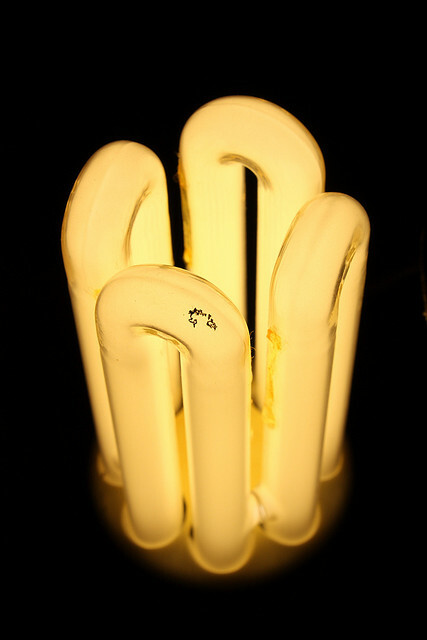 Though LED lights are more expensive, they produce less heat and are ideal for cold storage. Use occupancy sensors (best used with fluorescent lighting rather than with metal halides because fluorescent lights have virtually instant re-strike capabilities) in low traffic areas to trigger lights to turn on only when people are there. Use light level sensors or manual dimmers in areas that utilize natural light. 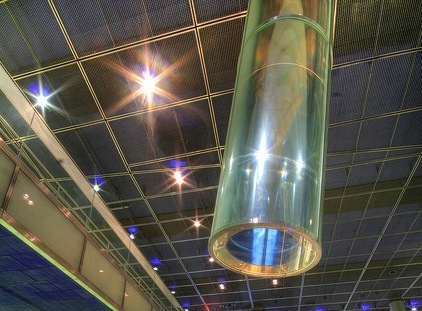 Light tube brings in sunlight from outside. Image courtesy of Till Krech via Flickr Creative Commons. Skylights are an economical way to bring lots of natural daylight into your warehouse and cut electricity bills. 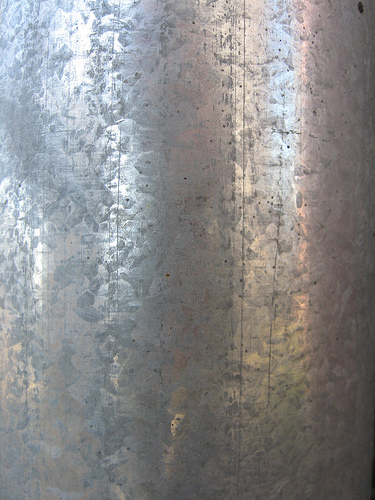 Light tubes connect to a domed translucent or prismatic diffuser that distributes natural light evenly throughout the area without heat gain or loss. And installation does not generally involve major construction. Cool Roofs are roofs consisting of materials that very effectively reflect the sun’s energy from the roof surface, thereby reducing the amount of heat absorbed into the building below. Cool roofs can also increase heating costs in winter months, but this increase is usually greatly outweighed by the energy savings achieved during summer months. 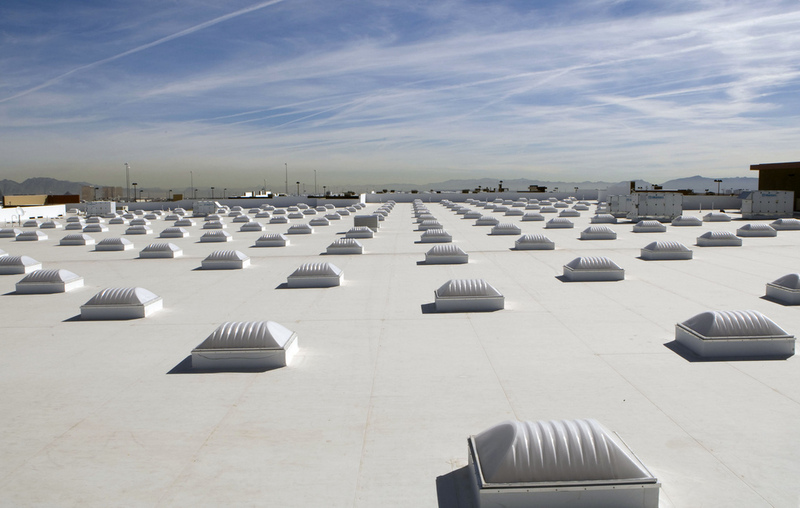 While it is true that cool roofs are mostly associated with white roofs, they come in a variety of colors and materials and are available for both commercial and residential buildings. Image courtesy of Peter Dutton via Flickr Creative Commons. High-volume low-speed (HLVS) ceiling fans save energy by improving air circulation and can lower the temperature in an air-conditioned space. 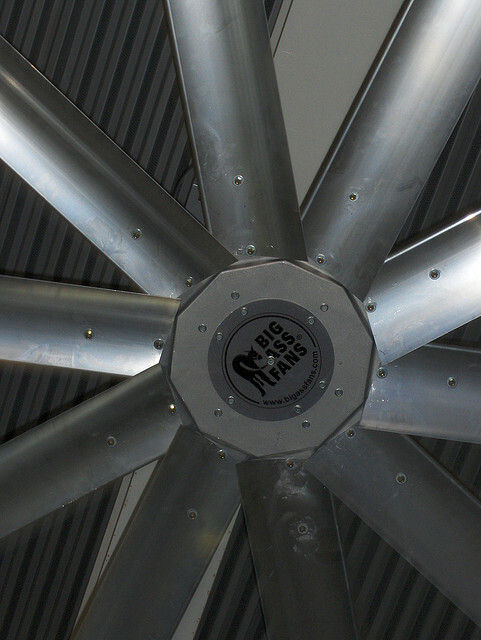 With diameters from 8 to 24 feet, these slow-moving fans circulate air better than smaller, higher-velocity fans. HLVS fans also reduce heating costs in winter by recirculating the warmer air near the ceilings. Though solar models are available, electrical models use very little energy. State-of-the-Art dock doors at Balzac Fresh Food Distribution Center. Image courtesy of Walmart Stores via Flickr Creative Commons. The loading dock is one of the greatest sources of energy loss. Dock doors and levelers can become damaged by forklifts, creating gaps along the frame and compromised seals. Regularly checking and repairing gaps in seals is a quick energy saver. Consider using double-loop compression seals that attach to the door panel for a highly effective seal. If your door becomes damaged beyond repair, you might consider upgrading to a fully impactable door to keep air from escaping. 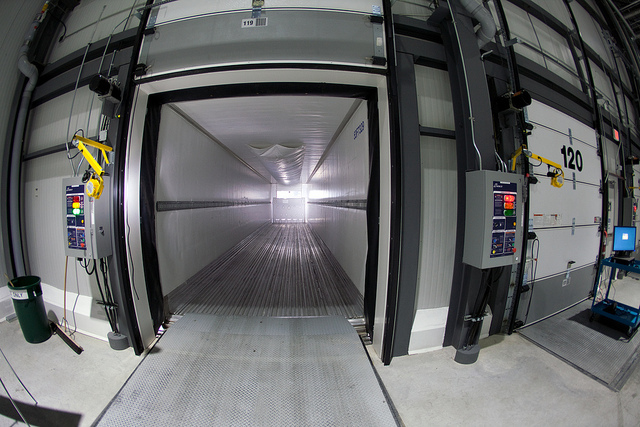 For high traffic cooler and freezer applications, insulated high speed cold storage doors will save on energy costs in the long run. 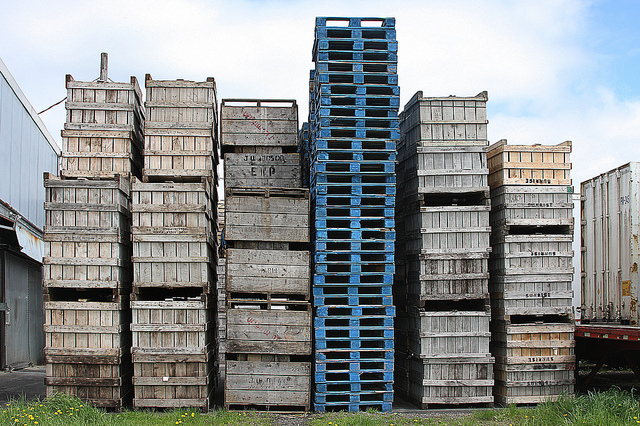 Apple Boxes and Pallets–Image courtesy of Liz West via Fliickr Creative Commons. You probably reuse pallets, but consider re-using cardboard and other packing materials as well. Implementing a returnable packaging system can also be a good solution. If you increase the life of the packaging and make it easy for customers to return (e.g., collapsible packaging or perhaps pre-paid freight), the packaging can be reused many times, reducing waste and saving money. If you can’t reuse, recycle! Sending used packaging and packing material to recycling facilities rather than waste facilities is the environmentally correct thing to do. Image courtesy of Lonnon Foster via Flickr Creative Commons. Whenever possible, opt for galvanized steel in your warehouse. Unlike painted finishes, which absorb light, galvanized steel is light reflective and can really brighten the warehouse, allowing you to use less artificial lighting. Galvanized steel is also 100% recyclable. Did you know? Galvanized steel base plates and braces are standard on all Next Level pallet rack uprights; however, all upright components are available in galvanized steel by special order. For more information about Next Level material handling products, visit our website. Click on images to view sources.